The planting season has begun! Thank you to Jo who came into school before the Easter holidays to do some planting with us. She did lots of weeding in our school garden and has set up the beds for different families of vegetables. We are planting broccoli in the photos above. 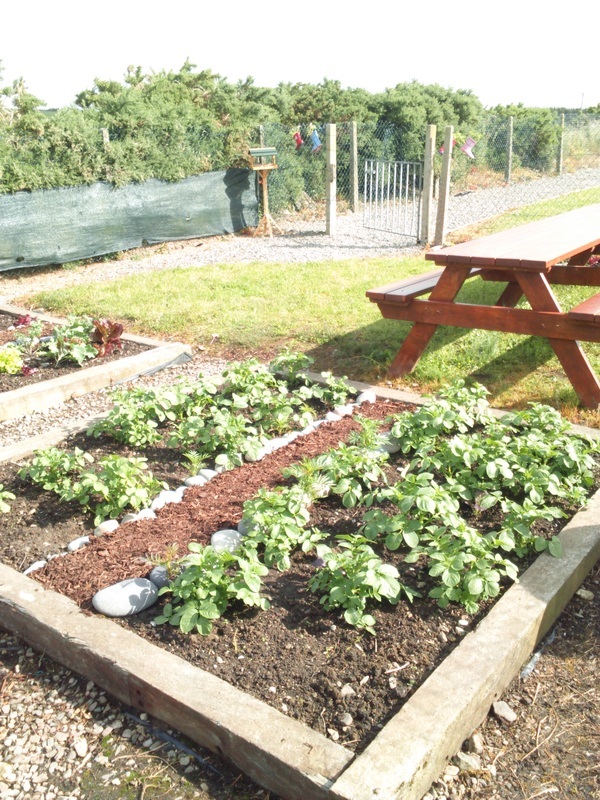 We are also looking forward to planting some potatoes and flowers in May. The children have worked so well together on the school garden this year, and the fruits of their labours are clear for all to see. Seeds sown in pots in school grew into plants which were then planted out. Not all of the seeds germinated, but nothing is guaranteed in gardening! Potatoes and baby onions were planted direct into the soil. 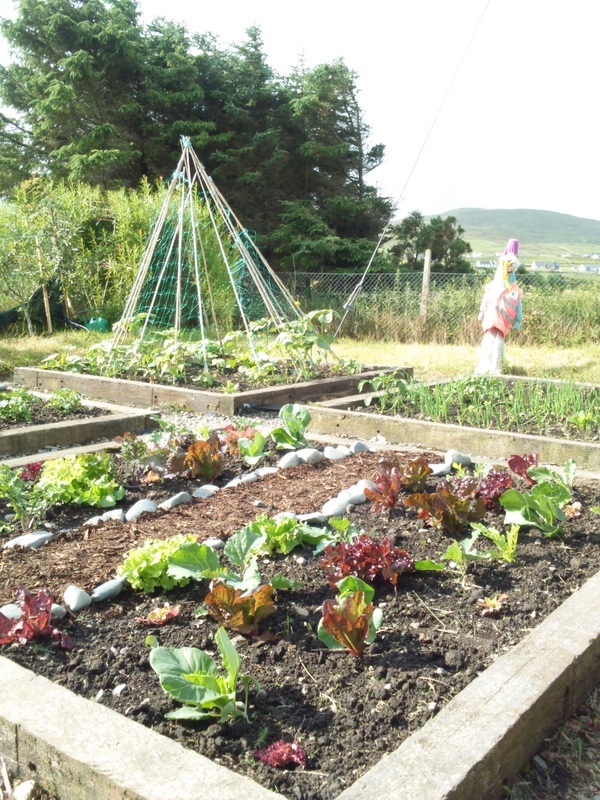 The garden is now filled with different coloured lettuces, kale, rainbow chard, potatoes, beans, peas, cabbages, sunflowers (not yet flowering), pumpkins, courgettes, onions, celery and herbs. The children were keen to get involved, and really enjoyed digging and weeding, sowing and planting, and finding an assortment of bugs. Apologies to parents for a few muddy knees! 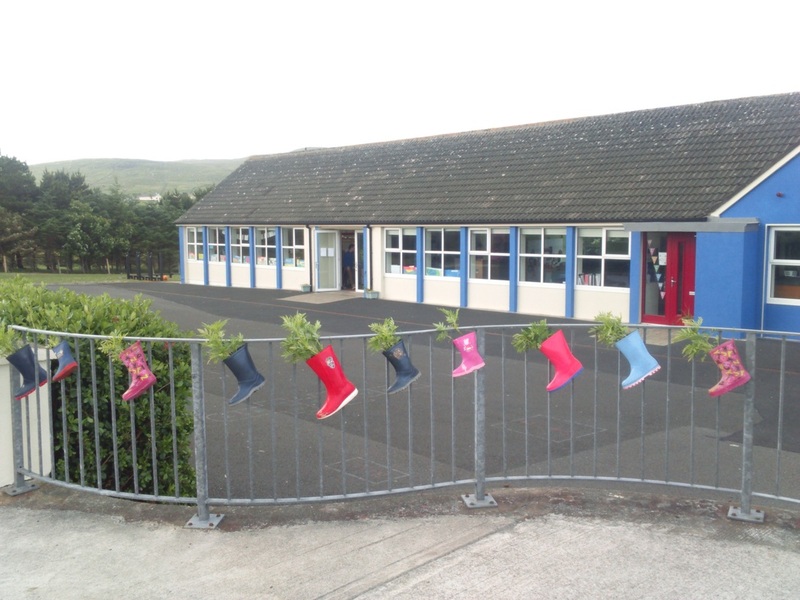 Our welly planters are now hanging along the fence at the front of the school, and either side of the gate leading into the school garden. There will be a tree planting on Thursday morning at around 10.45am, after the duathlon, and afterwards all parents are welcome to come and see what the children have achieved in the garden. If you’d like to take some lettuce home with you, let Jo or Nicole know and we’ll bag some up for you. During the summer holidays we will continue our regular weekly gardening slot on Mondays from 2pm – 3pm. Please feel free to come along – there is a huge picnic table available if you’d like to come a little earlier and bring your lunch. You may even see some birds coming to have their lunch at our new bird table. Watering if the weather is dry. There is a black hosepipe for watering, and the tap is along the top of the fence, to the left side of the willow dome. Aim the flow close to the ground to avoid damaging the plants. Weeding. Tools will be accessible in the bike shed. If you’re not sure which are the weeds, leave this job! Harvesting rainbow chard and lettuce. Feel free to take a few outer leaves from each lettuce, leaving the plants in the ground to grow on. Harvesting beans, peas and courgettes. Potatoes will be harvested when the children return to school. We plan to organise a Harvest Day in the autumn - a chance to get together and taste some of our lovely organic produce. The school garden team is currently very small, but we are passionate about creating a beautiful environment where the children can relax, play, and learn about nature and where their food comes from. If you would like to help by joining in with sowing, planting, weeding or watering, you would be made very welcome. Get in touch, or just come along one Monday from 2-3pm. ‘I was just sittin’ here enjoyin’ the company. 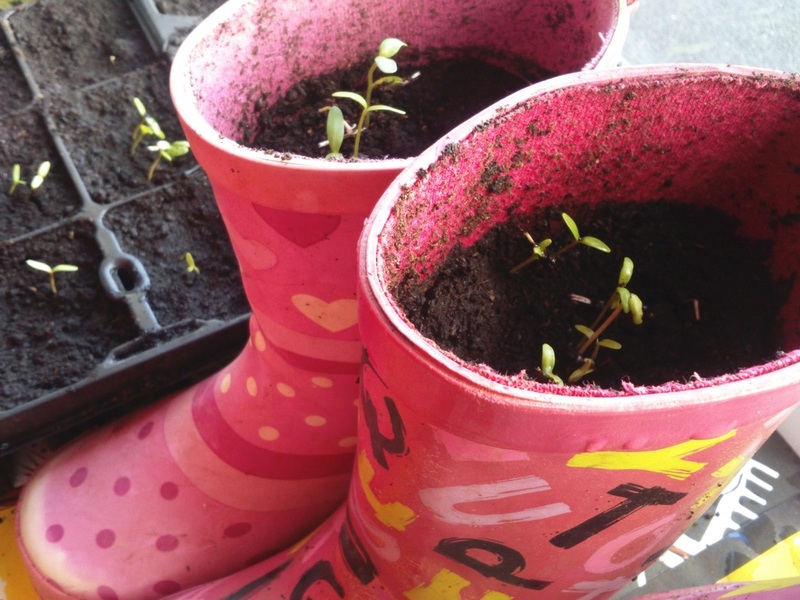 Last week the Junior Infants, Senior Infants and First Class children sowed some marigold seeds in the old wellies we had collected. The seedlings have now started to come up and we hope that they will become strong, healthy plants full of flowers to brighten up the fence of our garden! The children from the remaining classes sowed their choice of sunflower seeds, peas and beans in large yoghurt pots, and these are also starting to sprout. The beds have now been cleared of weeds and are ready for planting thanks to the lads from the Rural Social Scheme, who turned up, as promised, one wet and windy morning last week. Our regular weekly gardening slot will begin Monday 16th May from 2pm – 3pm. We will meet every Monday at the same time (excluding Bank Holidays). All parents and children who want to get involved are welcome to come along. Dividing the beds for ease of planting: we will be creating central paths with bark mulch on Wednesday morning (May 11th). Planting seed potatoes and onion sets direct into the soil. Setting up a bird table that has been purchased. We will soon be planting up our flower bed. Please bring in any plants that you have spare. We always welcome ideas for brightening up the school garden, or getting your children involved in growing their own food, so please do get in touch. The school garden team is currently very small, but we are passionate about creating a beautiful environment where the children can relax, play, and learn about nature and where their food comes from. If you’d like to help by joining in with sowing, planting, weeding or watering, you would be made very welcome. Our living willow dome has now been constructed, and last week Elvis Beetham gave a talk in each of the classrooms to explain how the willow will grow to create a leafy den to play in. 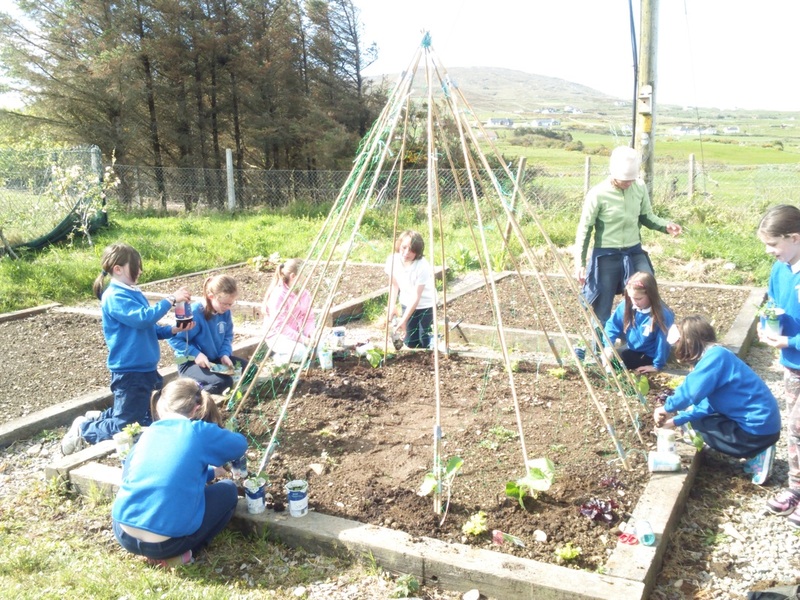 Ms Kilcoyne, teacher of the Junior Infants, Senior Infants and First Class spotted the wonderful picture below online and would like to create a similar display along the fence of our garden. 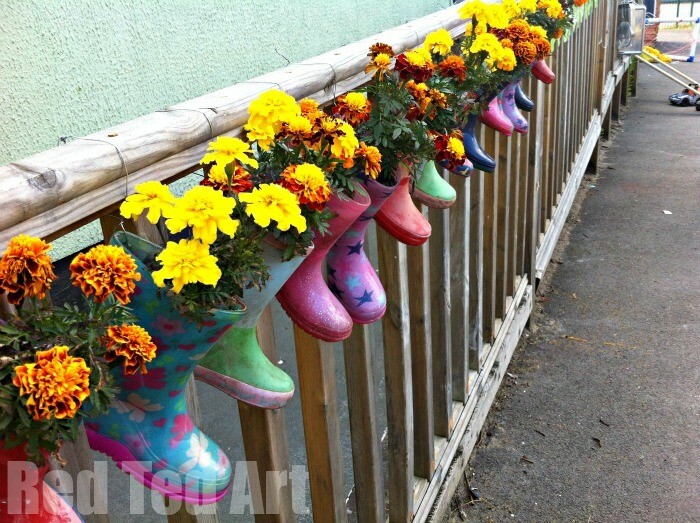 Old children’s wellies are needed for this project so if you have any lying around please bring them in; Laura will leave a box outside her classroom for them. If they are leaky, no problem as drainage holes will be made in them anyway. What a great way to recycle something that would otherwise be destined for the bin! If you have any ideas for brightening up the school garden, or getting your children involved in growing their own food, we would love to hear from you. The school garden team is currently very small, but we are passionate about creating a beautiful environment where the children can relax, play, and learn about nature and where their food comes from. If you’d like to help by joining in with digging, sowing, planting, weeding or watering, you would be made very welcome. No previous experience necessary! Weeding the beds in readiness for planting. Sowing sunflower seeds, peas and beans in large yoghurt pots (please collect these if you use them and keep them to one side), and keeping these watered in school. Creating a herb garden e.g. parsley, sage, lemon balm, dill, coriander, lavender. Sowing carrots direct into the soil. Planting up our flower bed. We are very grateful to the Rural Social Scheme gardeners who will once again be donating decorative plants to our school garden. As mentioned in the last newsletter, if you have sown any plants for us we would be delighted to incorporate them into our display! Constructing a bird table / feeding station. As we approach spring the school garden team have been turning their thoughts to this year’s growing season. Although it is still very early for sowing outdoors we will soon be starting off seeds to provide plants to fill the garden with later on. If you plan to sow seeds yourself at home perhaps you would consider sowing a few extra to provide plants for the school. Vegetables and flowers are equally welcome. 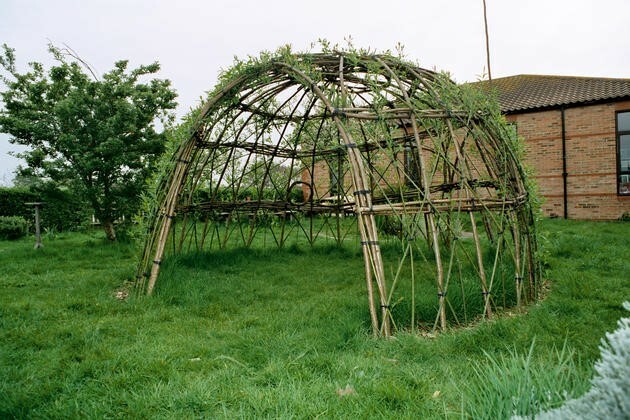 Tomorrow morning we plan to construct a living willow dome, similar to the one pictured below. 5th and 6th class will be helping: parents, please ask students to bring their wellies! Feel free to pop down if you’d like to join in. If you would like to get involved with the school garden in any way, please do get in touch with the school; you will be very welcome, and we would be very grateful. We hope to create a lovely environment where the children can relax, play, and learn about nature and where their food comes from. On April 22nd we spent a lovely morning with all the children in the school garden, planting potatoes, onions, green and red lettuces, and sowing beetroot and flower seeds direct into the garden. 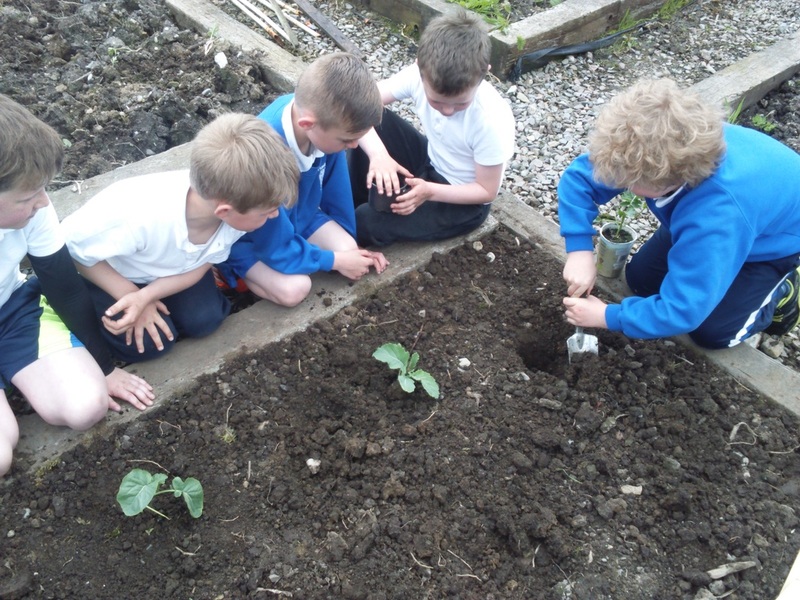 The children also sowed seeds in pots: sunflowers, peas and runner beans. We have also created a flower bed in the garden which is empty at the moment. The Rural Social Scheme team have kindly donated some plants from their polytunnel. We are aiming to plant these out next Wednesday morning, the 27th May, weather permitting. The forecast looks good at the moment! Feel free to pop down and join in if you’d like to, and if you have any spare plants that you think might be suitable for a school garden then we’ll happily find a space for them. Here’s to a long, sunny growing season!